Comprehensive wash process including Snow Foam, 3 bucket safe wash using a luxury lambswool mitt, chemical decontamination to remove iron particles and tar spots Full machine polish to remove 95% of paint defects and improve the appearance of the paintwork Gyeon Prep application to ensure the paintwork and wheels are spotlessly clean prior to applying the coatings Gyeon Quartz MOHS applied to paintwork in 2 layers according to manufacturer specification and allowed to cure for a minimum of 12 hours before collection. Gyeon Trim Coating applied to exterior plastic trims. Glass is polished and Gyeon View, a high performance water repellent, is applied to all exterior glass surfaces. This makes a big difference to visibility when you are driving in the rain. Alloy wheels are removed, prepared and Gyeon Rim is applied to all surfaces. Smooth, painted brake callipers are also protected with Gyeon Rim. Exhaust tips polished and protected with Gyeon RIM. Tyres Dressed with Gyeon Cure. Interior vacuumed and plastics/leather specialist cleaned as needed. Interior glass polished Carpets and fabrics protected with Gyeon Fabric Protection. Leather surfaces protected with Gyeon Leather Protection. 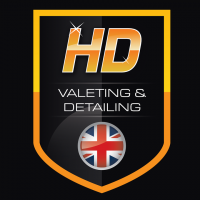 (Minimum 7 day booking) – 5 year manufacturers warranty supplied. Subject to T&Cs. We offer local pick-up and delivery if required (By prearrangement only – within a 20 mile radius). 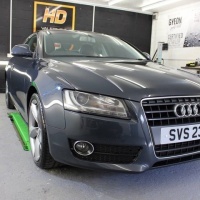 We recommend an annual maintenance clean to be carried out by us using Gyeon Cure to help aid the protection. Protection based on silicon dioxide (SiO2) is the most sophisticated technology of car protection that so far has been developed. Previously exploited by the most demanding consumers from the electronic industry or used to protect the railway rolling stock from acts of vandalism, this formulation is now introduced in its unique form to the automotive business by the GYEON brand. Owing to special chemical processes, silica is being blended with a suitable blend of solvents which allows its application onto the surface of the paint giving as a result substantial hardness. The crucial properties of the quartz coating are its ability to boost the total hardness of the paint and to increase it up to the level of 9H (hardness of the coating determined by Mohs scale) as well as its thickness. 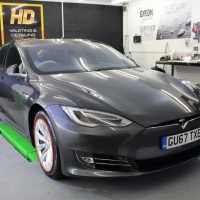 Therefore it should be referred to as something unique in the variety of automotive paints’ parameters, as it is the only coating with measurable thickness up to 1 micron. Depending on the number of layers applied, thickness of quartz coating may amount from 0.2 up to 1.5 microns. The most critical, however, is the structural integrity that the layer displays. After having vaporized all the solvents contained in the product, where 90 % evaporates within the first 24 hours and the total of 100% vaporization might be accomplished after 14 days (depending on the weather conditions), the layer becomes solid, very hard and highly durable. Owing to the quartz coating’s thickness, all the scratching and fading, which may appear during washing or as a result of extensive exposure to caustic substances e.g. bird droppings, do not reach the paint, leaving its surface intact. Moreover, it is entirely resistant to chemical substances (not only detergents) with pH between 2 and 11, which makes it outstandingly durable and insensitive to frequent washing with strong agents. Due to very small molecules tightly bonded together, any disarrangement of the structural integrity by external factors is technically impossible. The only way to remove the coating requires application of professional, intensive abrasives. All protective coatings created by GYEON are based on SiO2, which is a guarantee for an exceptional resistance to chemicals of pH 2-11, as well as to other harmful substances present on the roads and in the atmosphere. 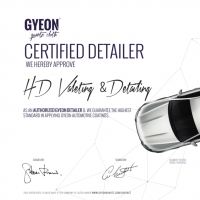 GYEON is a standard-setter when it comes to durability of protective coatings, offering all detailing enthusiasts a maximum performance, while professionals – a 5-year warranty for the GYEON Q2 MOHS+ protection. 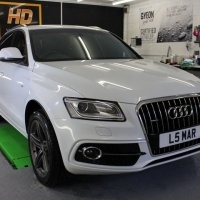 One of the primary reasons behind conducting an auto-detailing treatment is the protection of the surface, it is also to enhance of vehicle’s looks. GYEON combines exceptional durability with visual effects that often overshadow what natural waxes can do. Due to the most pivotal property of products based on SiO2, which has high capability of repelling water and contaminants, a vehicle protected with quartz coating remains clean significantly longer and its usual maintenance is much easier and less time consuming.